The domestic market remained steady with stable pricing and strong demand. Pruned logs became more plentiful in the domestic market as exporters tried to reduce pruned logs being supplied into China. Three years ago pruned Radiata pine logs were so unpopular in China that you had to make supply of unpruned export logs conditional upon purchase of pruned logs. Export log purchaser’s reluctantly acquiesced. Then pruned logs became popular in China as massive investments were made in clearwood processing and wood remanufacturing. Since 2015 the pruned log price has risen dramatically increasing the pruned log premium (the price difference between pruned logs and A-grade unpruned logs) from $35 to $70 m3. This, along with a downward trend in forestry discount rate, started to make pruning financially viable again on selected sites. However, it is suspected that the ramp up in export pruned log price was unsustainable as export pruned logs prices got well ahead of domestic pruned logs for a period last year, despite being of lower average quality, and often suffering from sapstain which degrades the visual appearance of the wood. 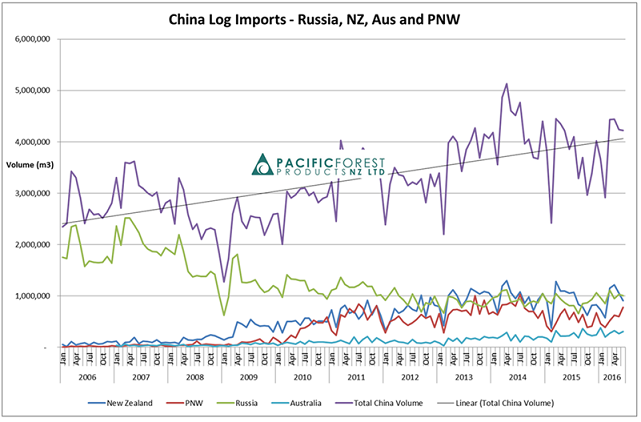 For a period this was overlooked in the market as demand for pruned logs remained high to feed the new processing capacity coming on stream in China. It now appears the market is “taking a breath” and pruned logs in China are again unpopular. Most commentators don’t think the price will fall much further but in two months the export pruned log prices have fallen $50/JAS m3. Time will tell whether the current price will rekindle demand. Log stocks in China have fallen steadily from 3.2 m m3 in late February of this year to 2.3m m3 in early August. Offtake/demand from the ports is reported at a healthy 56,000 m3 per day. This stock level of 41 days [of demand] is considered reasonably tight and lower than average. The Indian market is continuing its strong run and Korea and Japan are steady. The chart below shows the relative importance of the various log markets. 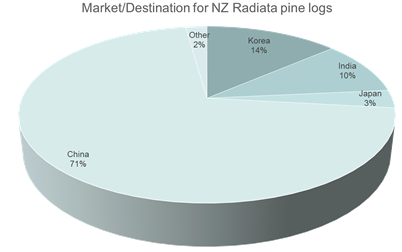 China and India are rapidly growing markets for NZ Radiata pine logs. Korea is steady. Japan, once the predominant destination, is now a very small part of the market. The US$:NZ$ cross rate increased just 0.5% from the beginning of July to the beginning of August but traded in a much wider 5% range during the month. As such, it had little impact on at-wharf-gate export log pricing from July to August. Log vessel charter rates, on the other hand have firmed a few US$/JAS m3 with a slight positive offset from lower bunker costs (fuel oil for log vessels). The strong NZ housing market and high levels of residential construction are buoying the market. The BNZ reports that in the June quarter the number of consents issued for new houses around the country was ahead in seasonally adjusted terms by 10% from the March quarter and 18% from a year ago. Australia has seen a slowdown in dwelling approvals in the past few months, but the full year figures are still strong. Forest and Wood Products Australia reports year-end May 2016 approvals totaled 231,081 dwellings, up 3.0% on the year prior. The Reserve Bank of Australia’s decision to lower interest rates by a further 25 basis points to a record low of 1.50% will likely prolong the long-running strong housing boom, especially the “hot” Sydney and Melbourne housing markets. This will maintain strong demand for wood products, including those imported from New Zealand. However, whilst Australia has formerly been the most important single market for NZ’s wood products, its importance has waned considerably over the past 10 years. 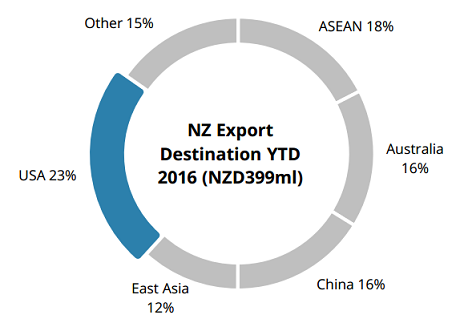 The chart below shows market share for NZ sawn timber exports (June 2016 year-to-date). Compared to the prior year, the value of timber exports to the USA is up 26% (recovering economy and housing market) and to Australia is down 13% (competition from Europe). Domestic log price and demand has been stable, supported by predominantly quarterly vs monthly pricing. Whilst there could be some easing of domestic pruned log prices based on more supply with the soft export market, good prices are still expected to be paid for quality logs. It could be that a bigger price differential for pruned log quality develops, which is probably a good thing. Unfortunately, Selwyn Sawmills announced in July that it was closing its doors. The sawmill has been operated by the Halliday family since 1938. Some of the reasons mentioned for the closure were prohibitive health and safety compliance costs, the need to invest large amount of capital into the enterprise and a shortage of suitable quality logs. 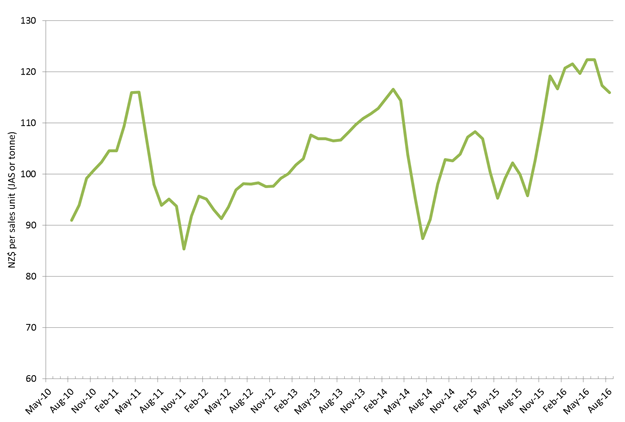 The PF Olsen log price index fell in August to $116 mainly due to falls in the export pruned log price. It is still $29 higher than its 6-year low of $87 in July 2014 and $11 above the two-year average and $13 above the five-year average. Despite the big fall in unpruned export log prices in July and the July/August falls in pruned export logs, the prevailing sentiment is for stable pricing and slight increases in export log prices for the remainder of the year. This is underwritten by relatively low log stocks in China and steady demand. The housing market in the big five coastal super-cities (Shenzhen, Guangzhou, Shanghai, Qingdao and Beijing) is strong with good demand for new houses/apartments. This is supporting demand for construction plywood and lumber. It is widely believed that the government restrictions on harvesting in China are now significantly constraining domestic log supply, creating more demand for wood imports. The Indian export log market is continuing with strong demand and pricing and Korea and Japan are steady. The domestic market’s strong run is expected to continue into the foreseeable future on the back of the strong NZ economy in general and housing market in particular and solid demand for our wood products in key export markets.